Someone somewhere once said: “The road to hell is paved with good intentions.” By the end of prolific New Brunswick author Valerie Sherrard’s newest middle-grade novel, no one understands that old adage better than Sherrard’s main character, Zoey. Random Acts uses an entertaining story to slyly teach readers some important lessons. Teenager Zoey and her two best friends, Jenna and Bean, make a food-coma-induced pact to do anonymous acts of kindness for classmates, neighbours, and each other. Not surprisingly, it doesn’t take long before things go awry. The magazines that Jenna donates to the student lounge expose a teenage indiscretion that leaves a classmate with hurt feelings. Zoey rakes and bags an elderly couple’s leaves, and ends up with a police officer on her doorstep. And Bean makes a well-meant phone call to Zoey that results in her being late for school. Although the girls’ intentions are innocent at first, their motivations become more self-serving: Zoey starts helping people to impress a boy she has a crush on and Jenna lets her determination overrule her judgment. Things get even worse when Zoey convinces herself that she’s doing a kindness by interfering with the clients at her father’s psychology practice. Sherrard handles the teenage egos with empathy and humour, never taking a judgmental tone. Her characters learn from their mistakes, and they work everything out for themselves – the adults in the novel are just there for support. 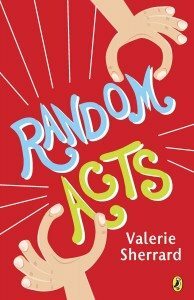 The author also achieves the difficult feat of creating authentic middle-grade voices, especially with Zoey, a protagonist who strikes a near-perfect balance between self-deprecation and awkward charm, resulting in a complicated character capable of navigating the pitfalls of her actions in an entertaining and relatable way.